1961 New Orleans Rascals started. 1963 George Lewis visited Japan for the first time, with his New Orleans All Stars. The Rascals experienced a jam session with them at American Cultural Center in Osaka. 1966 First visit to the United States and Canada. Received the Honorary Citizenship of New Orleans. 1970 Appeared at New Suntory 5, a Jazz pub in Osaka in celebration of its opening. 1971 Second American tour with Mitsuo Takahashi(alto saxophone), San Francisco - St. Paul - Connecticut - New York - New Orleans - Los Angeles - Hawaii. 1973 Were dispatched to the Japan Fair in South Carolina,U.S. as a cultural mission. Hiroyuki Yoshikawa substituted as a pianist for Adachi. Began to appear regularly at New Suntory 5 every Saturday. Keep playing there still now. Released the first major label LP "YOU RASCAL YOU". 1975 15th anniversary concert, invited Don Ewell (pianist) as a special guest. After that, exchanges with musicians from overseas have increased. 1976 Invited Alton Purnell who had been a piano player of the George Lewis' band. The session with him was recorded to a 2LPs album (is re-issued as CD now). 1979 Clarinetist Tom Sharpsteen's first visit to Japan. Concert with the Rascals at YMCA Hall, Osaka (recorded on LP). 1980 Geoff Bull's(trumpeter, vocalist from Sydney) first visit to Japan. Appeared at the New Orleans Jazz Festival. 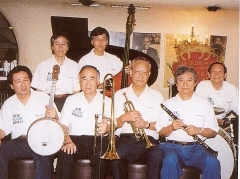 1981 Appeared at the Sacramento Dixieland Jubilee, U.S.
20th anniversary concert at Osaka SAB Hall. Special guests: Tom Sharpsteen and Mike Fay(string bass). Ryoichi Kawai opened his Mahogany Hall in his office building. It becomes a sacred place for New Orleans jazz. 1982 Vocalist Carol Leigh's first visit to Japan. She appeared at "Michigan Jazz Cruise" on the Lake Biwa. First Kobe Jazz Street. The Rascals continued to appear at this festival until 2010. 1984 Appeared at the New Orleans Jazz and Heritage Festival. 1985 First Satsukiyama Church (in a suburb of Osaka) Concert. The Rascals like to play at this hall, as their "second home ground". 1986 25th anniversary concert at Shimanouchi Church, Osaka. 1989 Visited New Orleans (to make a TV commercial). 1990 R.Kawai, K.Shiga, Y.Ozaki and N.Ishida appeared at the Santa Rosa Dixie Jazz Festival, U.S.
1991 Appeared at the Festa New Orleans Music Ascona, Switzerland (the first visit to Europe). 30th anniversary concert at Recital Hall. Special guests: Tom Sharpsteen, Bob Greene, Carol Leigh, Geoff Bull and Butch Thompson(piano & clarinet). 1992 Jon Marks's (pianist from Germany) first visit to Japan. He appeared at a concert at Satsukiyama Church with the Rascals. Visited Australia with Jon Marks for celebration of Geoff Bull's 50th birthday. 1993 Concert at Izumi Hall, Osaka(special guests: Carol Leigh, Tom Sharpsteen, Mike Fay and Fred Hard). Visited Belgium (trombonist Yoichi Yamada substituted for Fukuda). 1994 Visited Norway and Sweden. 1995 Invited vocalist Topsy Chapman from New Orleans as a special guest of the concert at Itami Aiphonic Hall. 35th anniversary concert at Osaka Phoenix Hall (special guest: Butch Thompson). 1997 Held the first concert in Tokyo (at Tokyoyamate Church). 1998 Concert at Changchun Methodist Church, Seoul, Korea. 2000 George Lewis Discography Concert at Mahogany Hall (in celebration of his 100th birthday). 2001 40th Anniversary Concert. 21 guest musicians visited for celebration from all over the world. 2002 Toyonaka Church concert in a suburb of Osaka in celebration of its 80th anniversary. 2003 Concert with Jon Marks (his third visit) at Ensemble Hall, Osaka. Appeared at the San Diego Thanksgiving Dixieland Jazz Festival,U.S. 2004 Concert with Lee Gunness (vocal from Sydney, Australia) at Shimanouchi Church (her second visit). 2005 Concert at The Industry Club Of Japan, Tokyo. 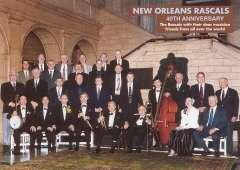 2008 Waseda University New Orleans Jazz Club celebrated its 50th anniversary. Ryoichi Kawai and Yoichi Kimura appeared at the memorial concert as originators of the club. Thomas LEtienne(reeds) visited Japan for the first time to play at Kobe Jazz Street. 2010 Toured England (Whitley Bay International Jazz Festival 2010) and Denmark with Geoff Bull. 2011 Their second visit to Switzerland with Geoff Bull. Appeared at Rapperswil - Blues n Jazz Festival. 50th Anniversary Concert at at Izumi Hall, blessed by their sixteen friends. 2016 Fay's Jazz Vipers from Los Ángeles visited Osaka, appeared at New Orleans Jazz at Church,etc.